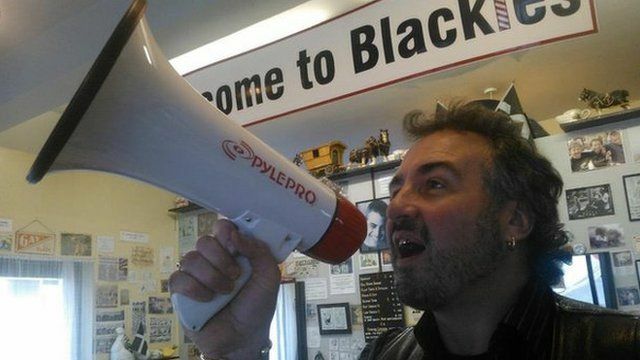 A barber from Cornwall who used a loud hailer to warn drivers against traffic wardens has been silenced by a warning from Cornwall Council. Andy Black, from Liskeard, stood outside his shop warning drivers traffic wardens were ticketing them. Cornwall Council has placed Mr Black on a "cautionary list" that logs everyone they think is a health and safety risk to its workers. Mr Black said: "I never threatened, cursed or swore. I was just having a bit of fun, and doing a bit of public service, warning people." In a statement Cornwall Council said: "The Cautionary Contacts List is an internal system which aims to protect Council staff from potentially harmful situations, including physical assault and verbal abuse." Mr Black has stopped using the loud hailer. Cornwall Council said it would be reviewing it Cautionary Contacts List in a year's time.